Mobile customer engagement empowers retailers to increase top-line revenue, strengthen customer relationships, and improve the shopper omni-channel experience. By leveraging the shoppers smart device in tandem with SoLoMo (social, local, mobile), retailers attract more in-store traffic, convert more shoppers, increase average customer spend, and improve customer loyalty and referrals. For only $49 /month Zuzapp provides retailers with a stunning branded mobile customer engagement app and messaging solution to better engage mobile shoppers and enhance the customer experience. With Zuzapp, retailers give shoppers exactly what they want, anytime and anywhere via their smart device. Zuzapp enables retailers to enhance the value of the shopping journey through a combination of personalization, savings, and engagement. Zuzapp gives retailers a proven solution to increase sales, improve customer satisfaction, and turn one loyal shopper into a legion of loyal customers. 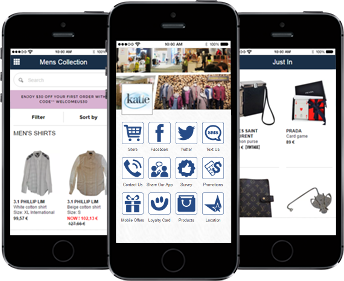 Mobile eCommerce Increase sales and conversion rates by selling products and services directly inside the retailer-branded mobile app. Mobile Coupons increase customer spend, drive in more traffic, and grow business through referrals. Loyalty Rewards foster loyalty and reward customers for making frequent visits and purchases. Mobile Clienteling Messaging improve customer satisfaction and recovery by allowing customers to make a request, share a concern and make a suggestion. Geo-targeted Push Notifications enhance the customer experience by sending captivating pop-up alerts to shoppers smartphones. Surveys Capture critical customer insight on their experience and satisfaction. Call for Action achieve your goals by prompting customers with a specific call-for-action i.e. make a purchase, redeem offer, attend special event, etc. Online Reviews increase reviews by digitally prompting customers to quickly and easily provide a review with one touch of a button. Viral Messaging Send promotions with incentives your customers want to share with their friends & colleagues i.e. specials, contests, and new products & services. Events increase attendance by publishing and promoting events and activities directly to customers smart devices. Localized engagement features enhance the customer experience with local and personal information such as FAQs, new products & services, etc. Social Media integrate with social networks such as Facebook, Twitter, Pinterest, YouTube, etc. Dynamic Back End Solutionweb-based management system includes two-way staff and customer messaging and alerts, content and graphics management, and account management. Analytics measure ROI with detailed reports on user downloads, user activity, offer redemption, etc. Pricing at only $49 /month Zuzapp delivers the best value in the market with no set up fees, no hidden fees, no extra fees, no surprises. Check out our happy customers.